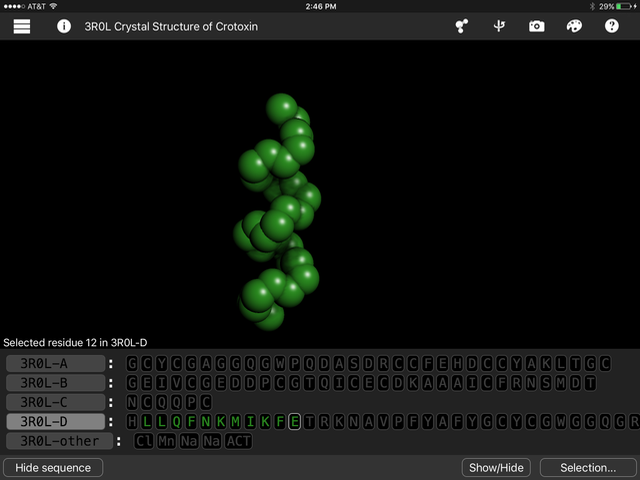 Touch the atom icon and choose residues to see how the sequences in four chains are different. If you open the color key, you can see the colors and abbreviations for each amino acid. When residue coloring is used, each amino acid appears with a different color. 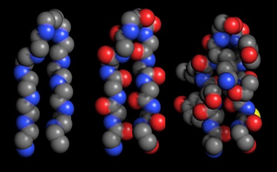 We can see that these four amino acid sequences are all different. Touch the atom icon and choose Secondary view. Use the color key to identify both types in the structure. 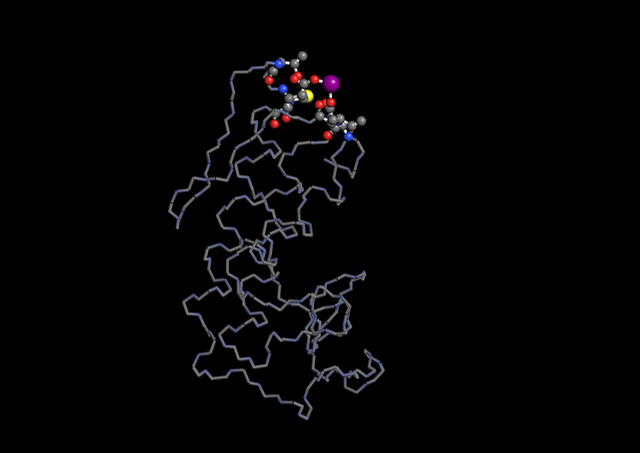 Both types of secondary structure are shown in this image of the crotoxin B subunit. 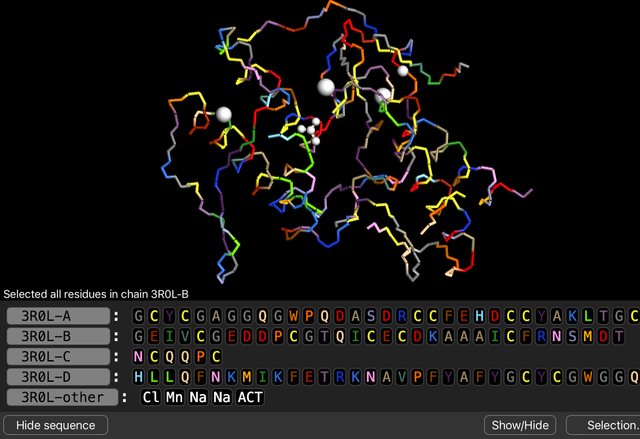 Find chain 3R0L-D in the sequence viewer. Touch the first set of green letters (LLQFNKMIKFE). One alpha helix will appear brighter. Open the Show/Hide menu and choose Hide unselected. The rest of the structure will dissappear. Touch the atom icon and pick the element coloring style. Open the Show/Hide menu and choose Complete backbone. Use the color key to identify the different atoms. Open the Show/Hide menu again and choose All atoms in residue. Now you can see where the side chains are positioned. 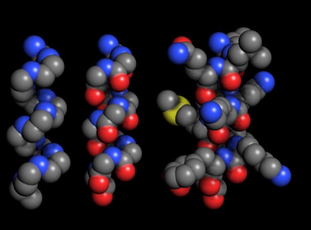 From left to right, this alpha helix shows the amino acid backbone, the backbone plus the oxygens, and the backbone plus the side chains. Scroll through the sequence viewer to find where the beta sheet begins. Touch all the letters in the beta sheet. Open the Show/Hide menu and choose Hide unselected. Touch the atom icon and pick element coloring style. The beta sheet looks like a loop. Open the Show/Hide menu and choose Complete backbone. This time, you can see the interactions between oxygens and nitrogens in different loops of the chain. Open the Show/Hide menu again and choose All atoms in residue to see where the side chains are located. From left to right, this beta sheet shows the amino acid backbone only, the backbone with oxygens, and the backbone plus the side chains. Touch the names 3R0L-D and 3R0L-other. The "other" row is a list of chemicals in the structure. Open the Show/Hide menu and choose Hide unselected. The objects that remain are a tertiary structure. Touch the atom icon and choose Secondary view. You can see this chain contains both types of secondary structure. Explore bonds to metals Touch the atom icon and Choose Reset View before going on. Open the Show-Hide menu and choose Hide unselected. Touch the name 3R0L-D again to deselect it. Open the Selection menu and choose Select nearby. Open the Show/Hide menu and choose All atoms in residue. Touch the atom icon and choose the Ball and Stick drawing style and element coloring style. Now, you can see there are bonds holding the manganese atom in place. Similar bonds hold the sodium atoms in place as well. Oxygens on amino acid side chains form bonds to manganese and hold it in place. Explore disulfide bonds Touch the atom icon and Choose Reset View before going on. Open the Selection menu and type C.
Touch the atom icon and select the Ball and stick drawing style and element coloring style. Touch the names of chains A, B, and C twice to select and deselect them. Now, the cysteines will only be selected in chain D.
Touch 3R0L-D to select chain D.
Open the Show/Hide menu and choose Hide unselected. The disulfide bonds between chains can be seen. Yellow disulfide bonds hold alpha helices together in crotoxin. Touch the atom icon and the Spacefill drawing style and molecule coloring style. Open the Show/Hide menu and choose all atoms in residue. You can see all four chains. Touch the atom icon and Choose Reset View before going on. Touch the name of chain 3R0L-D to select it. Open the Show/Hide menu and choose Hide unselected to hide chains A, B, and C. These chains are involved in binding to the cell membrane but they don't contribute to the phospholipase activity. Touch the atom icon and choose the hydrophobicity coloring style and the spacefill drawing style. Open the Show/Hide menu again and choose All atoms in residue. Touch ACT in the 3R0L-other chain to highlight acetate. 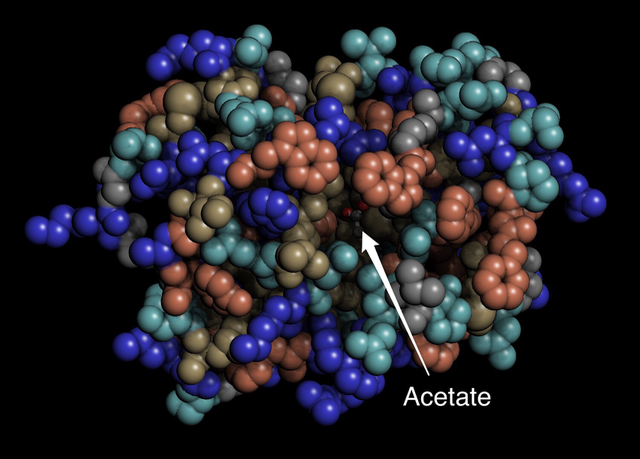 Acetate is a product of phospholipase activity. 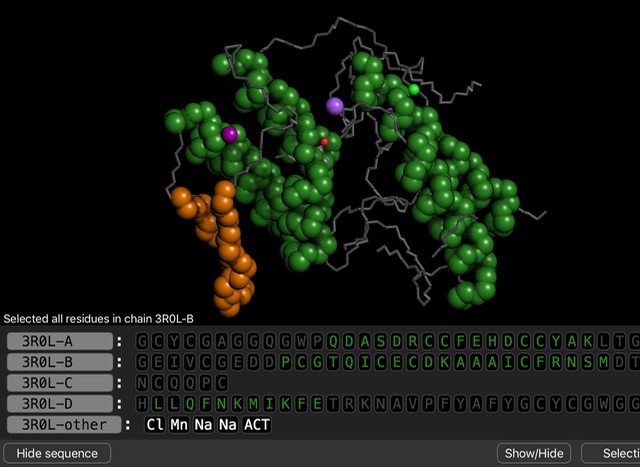 Hide the sequence viewer and turn the structure around to view the acetate inside the enzyme at the active site. 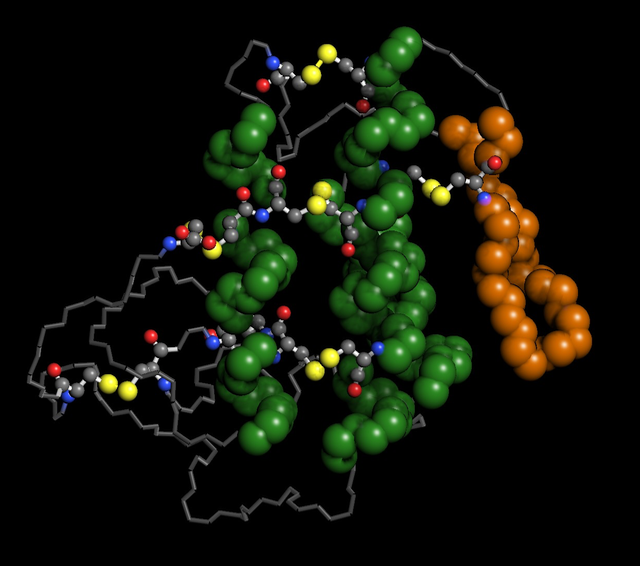 Crotoxin colored by hydrophobicity with acetate bound in the active site. Harris JB, Scott-Davey T. Secreted phospholipases A2 of snake venoms: effects on the peripheral neuromuscular system with comments on the role of phospholipases A2 in disorders of the CNS and their uses in industry. Toxins (Basel). 2013 Dec 17;5(12):2533-71. doi: 10.3390/toxins5122533. Faure G, Xu H, Saul FA. Crystal structure of crotoxin reveals key residues involved in the stability and toxicity of this potent heterodimeric β-neurotoxin. J Mol Biol. 2011 Sep 16;412(2):176-91. doi: 10.1016/j.jmb.2011.07.027.